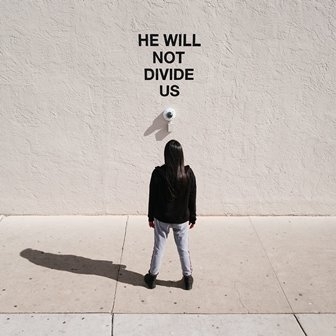 When pushed a little further, Turner said that three artist — actor, Shia LaBeouf, Nastja Rönkkö and himself — began a “participatory performance” art piece called “He Will Not Divide Us.” The work began on January 20, 2017 in New York City, and moved to Albuquerque, New Mexico on February 18th. The performance piece is public in nature, inviting people to say the words “He Will Not Divide us” into a camera mounted on a wall. Born in Manchester, England, the London-based artist is a graduate of the Royal College of Art, receiving a Master’s Degree in photography . How Turner connected with Shia LaBeouf was not stated. All I know is that as I walked down Central Avenue (historic Route 66) after viewing an exhibit at 516 Arts there was a crowd of roughly 100 people surrounding a camera mounted on the wall behind the El Rey Theater. Journalist and TV cameras were about . 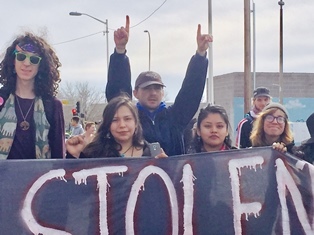 Some of the crowd were holding up signs including “This Is Stolen Land,” other people listened to individuals talking into the camera placed against the wall. There wasn’t a cohesive message to the gathering, but one thing was clear: the crowd was not pleased with the current political administration of the United States. As I approached the wall the words “He Will Not Divide Us” hung above the camera. As I got closer I heard a Native American youth rapping into the live web cam. Shortly after, a man in a ball cap and pony tail rose from the crowd, hugging the rapper. It was LaBeouf. And over the course of 30 minutes, LaBeouf worked the crowd like a passionate preacher, chanting, hugging, listening, and stopping for pictures. 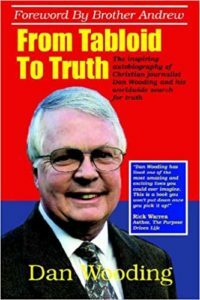 At one point he walked down Route 66 to a store and bought items for the crowd. For my part, I walked towards a bearded man with a tan hat carrying a camera and backpack. It was Luke Turner. We talked for a few moments where I got a sense of the performance piece. Mr. Turner was smiling, happy to see the ever-increasing crowd grow. As word got out, I saw teenagers with cameras in tow walking down Central Ave looking for the performance. 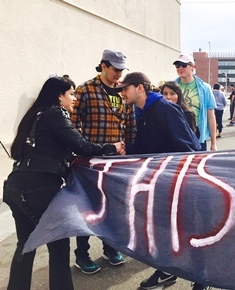 Some came to protest, others to see LaBeouf. Later I learned that the performance piece was shut down in New York City after allegations of aggression. The work was moved to Albuquerque where LaBeouf and team received permission for the performance from the city. During my time at “He Will Not Divide Us” the gathering was peaceful, though the street was shut down. A couple of politicians and policeman were not too far way. One politician, Pat Davis, encouraged the freedom of speech, saying in a KRQE interview, “They came looking for a new place that was more welcoming and more open to be a part of this national conversation, pretty cool they picked the city of Albuquerque, on a random sidewalk downtown” . Whether or not one agrees with the sentiment behind the performance, one thing was clear: people were exercising their rights as citizens to voice their personal concerns. And for this I was pleased. We live a democracy where freedom of speech is encouraged. And I think we’re the better for it. And protest — be it with art or activism — is nothing new. It goes back to the earliest moments of human history. Even the Bible is full of protest; be it Moses protesting the treatment of the Hebrews or early Christians protesting the treatment of the new faith movement. The bottom line is that protest goes hand-in-hand with being a human. Yet underneath the idea of a protest lies something deeper, more philosophical and moral. At its heart, protest carries the notion that something is unjust; that the world is out of alignment, that truth is not being heard. And because of this people react, they protest. The definition of protest is “a statement or action expressing disapproval of or objection to something.” The prefix, pro, is from the Latin meaning, “bringing something publically forth.” And the suffix, test, is taken from the Latin “testis,” a witness. To protest is to be a public witness . The protest movement of the past should not be allocated to just Biblical examples; social protest abounds as well. Here in America we are familiar with protest movements such as the Civil Rights movement (led by Martin Luther King, Jr.) and Vietnam protests (led by such divergent individuals as Abbie Hoffman and Daniel Berrigan, S.J), among other more recent protest movements such as Black Lives Matter. In a way, protests prove that we are people with principles, moral creatures created to for truth, beauty, and goodness; though not all protests claim — or do — uphold these tenants. Protests demonstrate that there is a moral order the universe. And though the performance artwork “He Will Not Divide Us” is not touted as a protest per-se, one can easily see what LaBeouf, Turner, and Rönkkö are trying to accomplish falls well within the accepted definition: it is a public witness. And because of this, it is protest for people using performance art to make a point, a positive one at that; a subtle reminder that power in a democracy still can reside with the people. Photo captions: 1) LaBeouf with participants. 2) LaBeouf thanking participants. 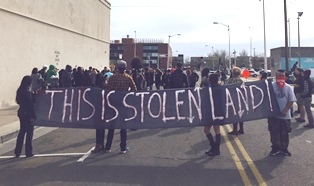 3) This is Stolen Lands sign. 4) Brian Nixon with Luke Turner.